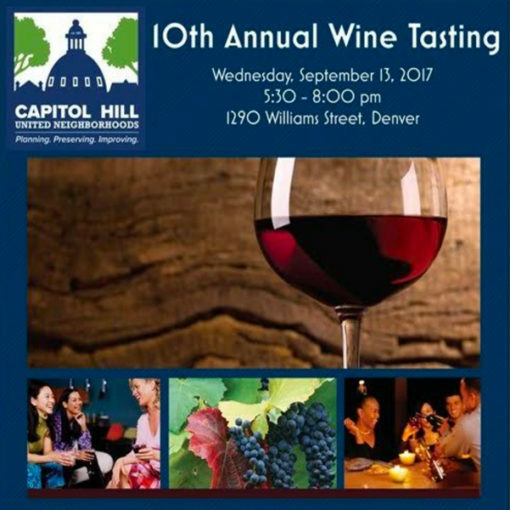 On Wednesday September 13, 2017, Tears McFarlane House & Garden will welcome the community to enjoy wine tasting and hors d’oeuvres for the 10th annual Capitol Hill United Neighborhoods Wine Tasting. Denver’s most charitable tasting invites friends and neighbors from every corner of the city to celebrate the community while kickstarting the fall season. Your support and attendance directly benefit Capitol Hill United Neighborhoods, community engagement efforts, and the historic Tears McFarlane house and center. Participation will advance Capitol Hill’s United Neighborhood’s mission of “Preserving the Past; Improving the Present; and Planning for the Future”– making it possible for them to continue advocacy for smart zoning and land use, the protection of historic landmarks, community safety, neighborhood beautification and the Tears-McFarlane House & Community Center! Proceeds from the event will benefit Capitol Hill United Neighbors (CHUN) in their mission to protect, preserve & enhance the quality of life in and around Capitol Hill. Good Chemistry is a proud business member of CHUN and representatives of our team our team will be volunteering their time to help coordinate the event. CHUN is just one of the organization’s Good Chemistry is proud to support. Learn more about those organizations and how to support them here. Join us in a celebration of wine, food, culture and community at the 10th Annual Community Wine Tasting! Tickets: $35/ guest purchase before Sept. 12 — $45/ guest at the door. Tickets can be purchased in advance by clicking here.